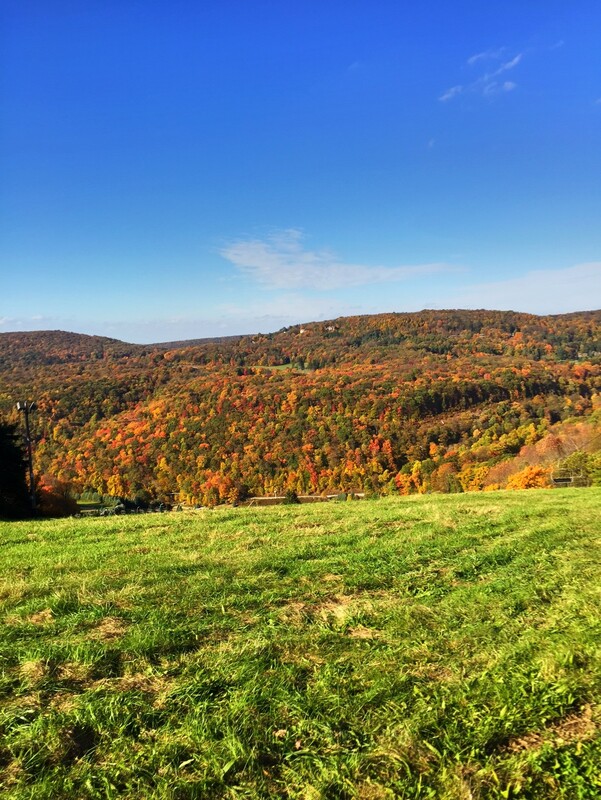 My friend Helen Durfee always said that the fall season in Western Pa is just as nice as Vermont, just a little less dramatic. She grew up in the Laurel Highlands and lived the first part of her married life in Vermont. I agree that Vermont and New England are famous for “leaf peeping” but I have to say that this particular fall here in Western Pa. has been spectacular. I have been treated to some amazing days of mountain biking and hiking this fall where I have taken the time to enjoy the color of the leaves. I have taken the time to “savor” the days like a fine steak or fresh seafood. I try to take little bites and enjoy the flavor. Like my commute to work on Squaw Run Road. I don’t go the fastest route to work but rather the scenic roads to enjoy the changes in the leaves each day. This year the changes have been remarkable. Another contributing factor to my enjoyment of Fall 2016 has been the app that was suggested to me by my friend Eric Durfee( Helen’s husband and native Vermonter). It is called ProHDX and can be downloaded on your I-Phone. This particular app allows you to shoot a photo and really get the focus and colors sharply so that the end result is an I-Phone photo that looks particularly good compared to most. I am not a real good photographer and the only camera I have is on my I-Phone. But I have really enjoyed using this app and the convenience of the I-Phone on a ride or a hike can yield some spectacularly sharp images. 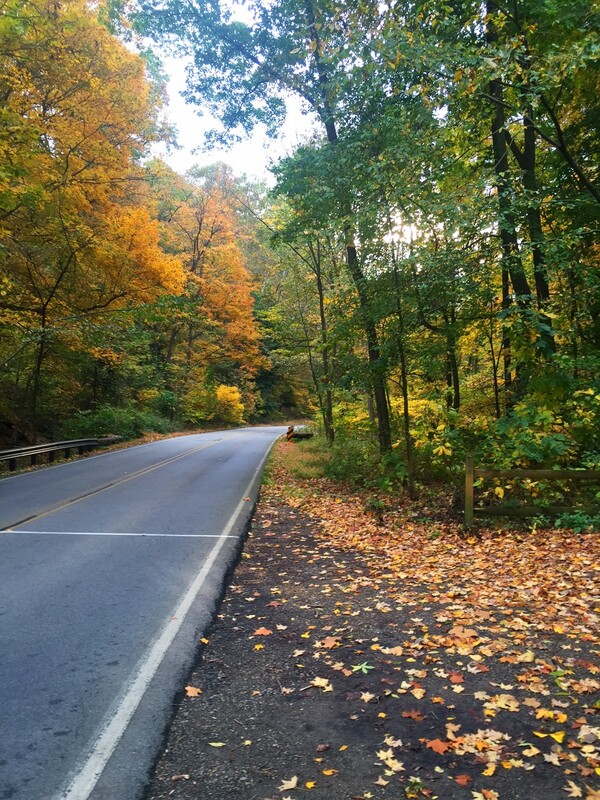 The one nice thing about a hike or taking in the view from a mountain bike is that you can avoid all of the cars packed with “leaf peepers” and enjoy the quiet transformation of the season in the woods of Western Pennsylvania. Many past seasons have been rushed with race pace rides looking at nothing other than the persons backside in front of me. Games, practices, kid’s activities take a lot of time and effort for many of us. But as you age and the seasons of rushing to activities wane, it is a great practice to slow down, take in the seasons, and enjoy the flames of the maple leaves, the golden colors of the oak trees and even the pale shading of the ferns on the forest floor. 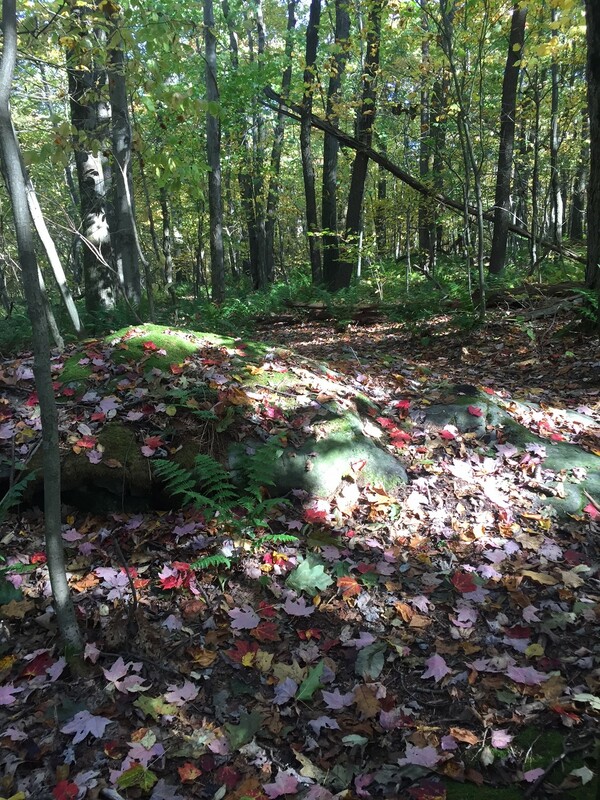 In my old backpacking days, I did take the time to hike and enjoy the fall in the Laurel Highlands. But in the many years since, those times had been replaced by soccer games, basketball games and general activities with my wife and son. Now I have a college student who does his own thing, and my wife and I are trying to slow down and enjoy what God provides for us by way of a natural display of color. So, I guess the message here is to savor your experiences. The yearly season change where the warm days try to hang on into Indian Summer, create some spectacular viewing if you take the time to enjoy the days. You don’t have to go to the mountains to enjoy the scene. Just look out your window, your windshield, or take a walk in the neighborhood. Smell that fall aroma of leaves. See the tannin of the leaves change the creek colors. Notice the difference. Slow down. Thanks for reading. This entry was posted in Aging, American Culture, backpacking, Bicycling, Cycling, Health, Motivation, Mountain Biking, outdoor activities, Outdoors, trails and tagged I-Phone Photography. Thanks Pat. Fall is my favorite season. Everything is perfect. Everyone is out and about trying to enjoy the last few nice days. People are mostly in a good mood with kids settling into school, sports are in high gear, and the anticipation of the holidays and winter tend to round people’s edges this time of year. The funny thing is it always seems to be the shortest season because there is so much going on. Maybe if I took your advice, it wouldn’t feel so fleeting. Are you sure Helen said that???? Yes she did. Ask her. You’re right Helen we have some of the most beautiful scenery in the country right here. I will take your advice Pat and savor the beauty of the season and the changing leaves, even when I’m raking them. Besides we know what’s coming. This year was a spectacular year for fall colors pat! Thanks for the advice about slowing down, we all need to do that and enjoy the moment more. But can we slow down and still get first chair? pat a post we all can relate to , so beautiful the change and the weather makes for ever changing days of enjoyment outdoors. and not to be out done the big flakes will be coming soon ! 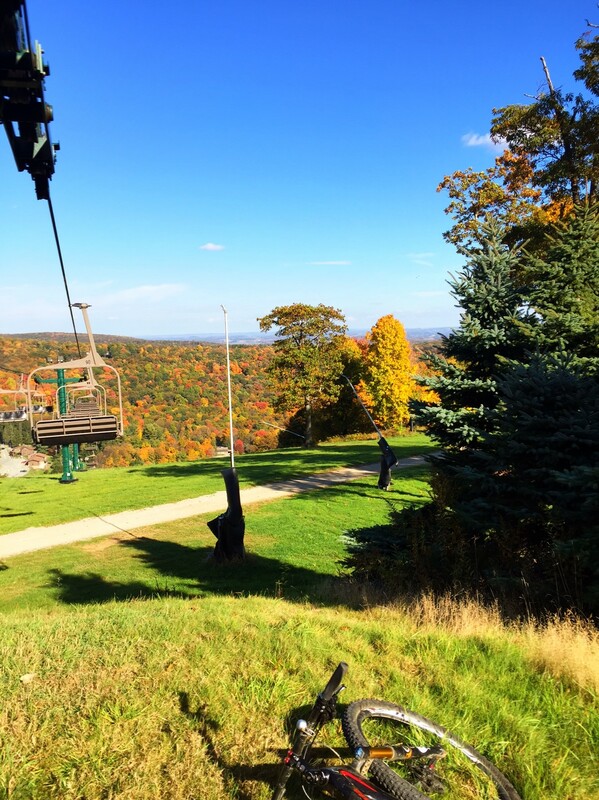 The leaves are peaking in Ellicottville. Prettiest year I can remember up here.